Bob Baker's Indie Music Promotion Blog: Are You Ready for the Next Little Thing? "After years of being about the Next Big Thing, the annual International Consumer Electronics Show this week is all about the next little thing - small-in-one devices that are blurring the distinctions among tiny netbook computers, dedicated media players, e-book readers and cell phones." "... content is the new king. As different people use electronics in different ways, publishers [and anyone who creates "content," like musicians] are under the gun to deliver whatever content people want on whatever devices they have." So, are you meeting your fans where YOU want them to, based on YOUR idea of what the right platform is? Or ... are you meeting your fans where they ARE? Think about the next little thing as you plan your music promotion in 2010. P.S. 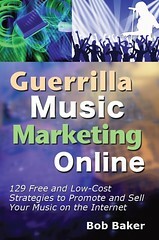 Put your music marketing on steroids! Visit my new project: The Virtual Music Coach.